The Comfort Inn Virginia Horse Center hotel in Lexington, VA near the Virginia Military Institute Museum will get you rested and ready for anything. 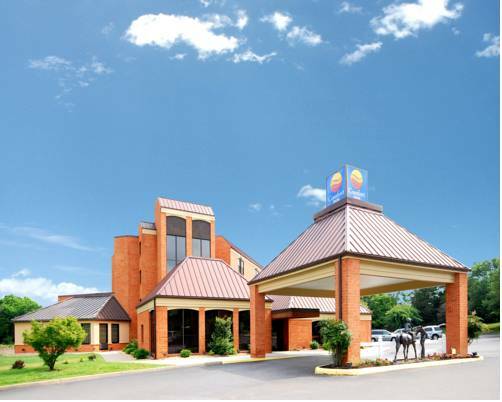 This hotel is near attractions like Washington and Lee University, Natural Bridge of Virginia - National Historic Landmark, Shenandoah Valley Agricultural Research and Extension Center and Blue Ridge Parkway. Amenities include free breakfast, free WiFi, free weekday newspaper, an indoor pool, a picnic area, sundeck, copy and fax services and free coffee. Your spacious room features a coffee maker, hair dryer, TV, iron and ironing board. Also, earn rewards including free nights and gift cards with our Choice Privileges Rewards program. Please do not request non-smoking rooms when they are not showing available. Pet accommodation: 25.00 USD per stay. - Shenandoah Valley Reg. Arpt. - College Square Shopping Ctr.